20% Off Sale! Columbus Day Weekend! New Hours! The Big Man has some news for you! It’s that time of year again! 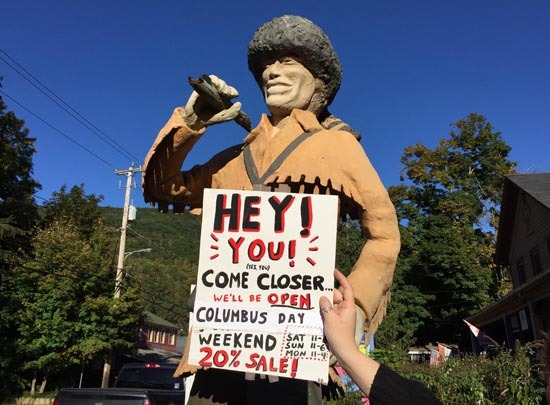 The Catskills leaves are changing, the Phoenician air is fresh, the sun is shining, AND it’s time for our annual Columbus Day Weekend blow-out yee-haw whoop-dee-do 20% off sale! Everything vintage in the store is on sale. Records, vintage clothing, lighting, etc….you know the drill. Get yourself up to the Catskills this weekend for some season peaking leaf peeping, crate digging and vintage shopping. Seven rooms in a former 1800′s hotel packed to the rafters with antiques, vintage doo-dads, thousands of vinyl records, and tons and tons of vintage clothing. After this weekend, our hours are changing to weekends only: Saturdays 11 – 5, Sundays 11 – 4. Will we stay open for the winter? We’re not sure yet, but you’ll be the first to know. (If not, we WILL open for holiday weekends – Presidents’ Day Weekend, etc. – until we re-open in the spring for our 16th season in Phoenicia). This entry was posted on Wednesday, October 5th, 2016 at 12:51 pm	and is filed under Sales and Announcements. You can follow any responses to this entry through the RSS 2.0 feed. Both comments and pings are currently closed.